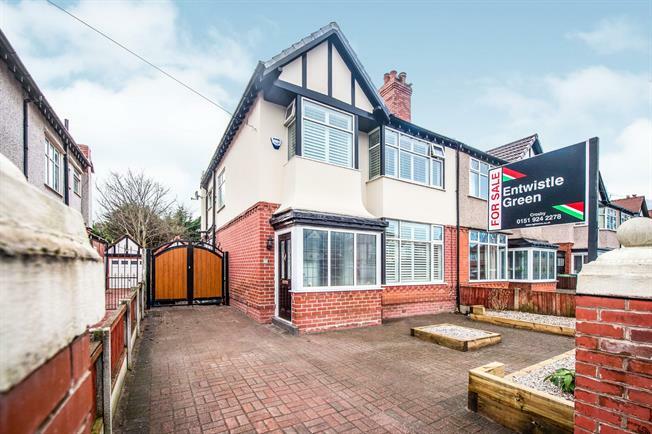 3 Bedroom Semi Detached House For Sale in Liverpool for Offers Over £325,000. Situated in an ideal Crosby location, this stunning family home has been finished to a high specification and is being offered for sale with no ongoing chain. This ideal semi-detached boasts beautiful character features whilst being modernised throughout and comprises; porch, entrance hallway, two spacious reception rooms, extended kitchen/dining room, first floor landing with three bedrooms and family bathroom. The property benefits from off road parking, garage and attractive rear garden. Early internal inspection is highly recommended. Double glazed uPVC window and door. Feature light fitting. Amtico flooring. Radiator. Feature light fitting. Amtico flooring. Double glazed uPVC bay window with shutter blinds. Radiator. Feature light fitting. Amtico flooring. Double glazed uPVC window with shutter blinds. Radiators. Fitted wall and base units with complementary work surfaces and upstands. Porcelain floor tiles. Range oven. Dishwasher. Double glazed uPVC windows to side and rear with shutter blinds. Porcelain floor tiling. Double glazed uPVC window with shutter blind. Radiator. Low level wc. Wash basin inset vanity unit. Amtico flooring. Double glazed uPVC window. Double glazed uPVC bay window with shutter blinds. Fitted wardrobes and bedside tables. Radiator. Double glazed uPVC bay window with shutter blinds. Fitted wardrobes. Radiator. Impressive four piece bathroom including; walk in wet room shower with thermostatic power shower, tiled bath, low level wc, wash basin. Double glazed uPVC window. Tiled walls and flooring. Power and lighting. New up and over door. Driveway to front. Rear garden with artificial lawn, stone patio and seating area.